Click here to visit the Redplum site and change the zip code they give you to 11758. 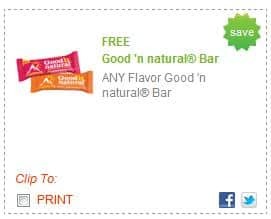 Then on the “Grocery” category you should be bale to spot the coupon above for a free Good N’ Natural Bar product. Note: Please keep in mind that not all stores like to accept printable coupons for free products. I’ve had good experiences and bad, so your mileage may vary on this one.